Summer is winding down around the Ranch. 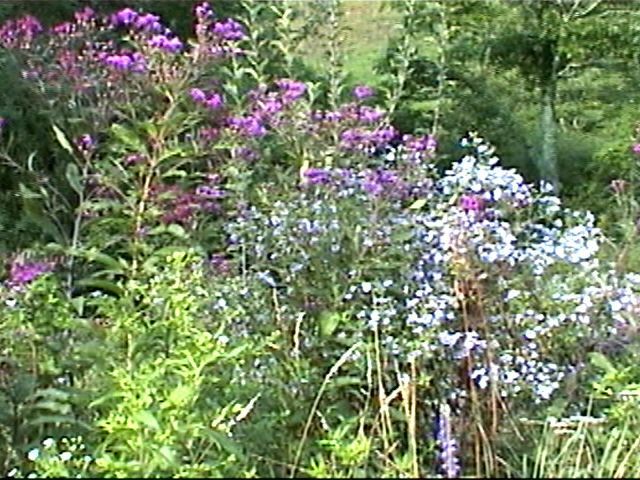 The wild flowers around the house are at their peak. 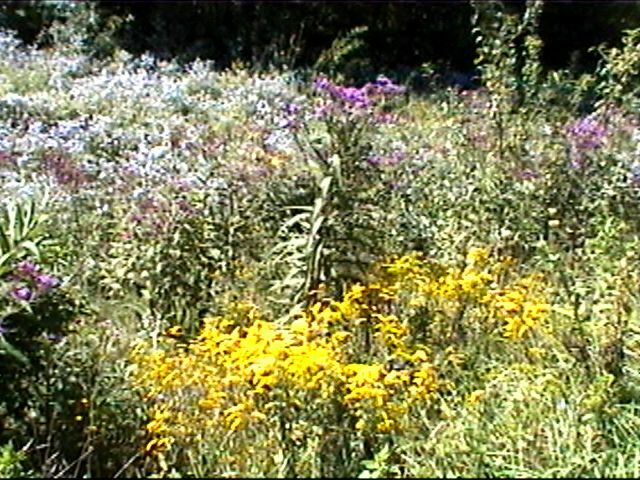 This field is full of all kinds of different wild flowers, all of them in different shades of Blue. 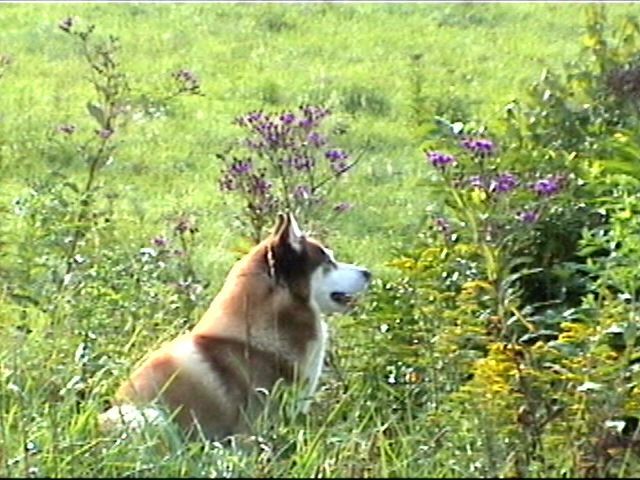 Timber enjoying the sights, sounds, and smells today too..
Back in the house... all the lumber I unloaded last week has been planed, cut, artfully carved on, sanded, and shaped into railing and posts! 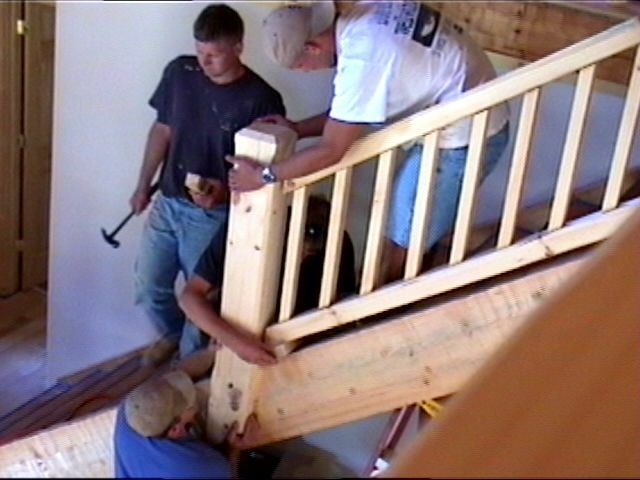 Here it was all hands on deck as the guys struggling to get one of the post on the stairs in. Dad and Chris in deep discussion on getting this shoe rail to fit. 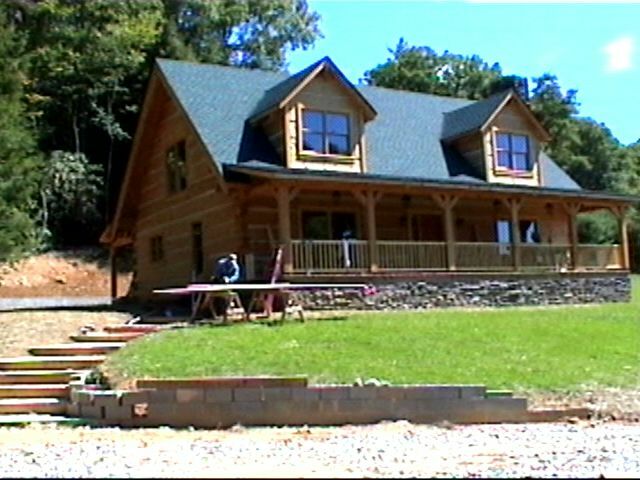 After the inside railing was done, they moved out to the porches. Here Dad is putting all the dowels in for the handrail to go on. The kitchen counter tops are done now. Dad and Chris did and excellent job putting down this porcelain tile. 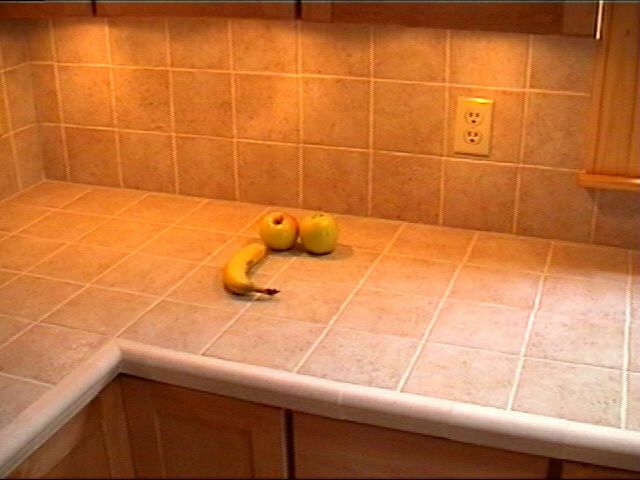 It was a very challenging job and it was their first counter top. It is absolutely perfect! 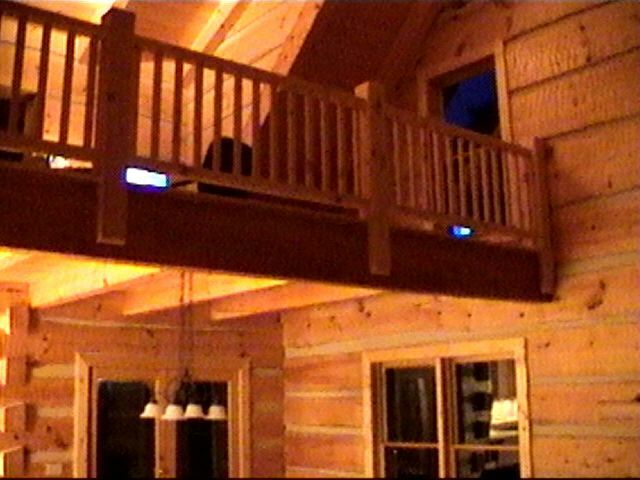 We wondered how to terminate the railing into the roof in my bedroom upstairs. This is what I came up with. 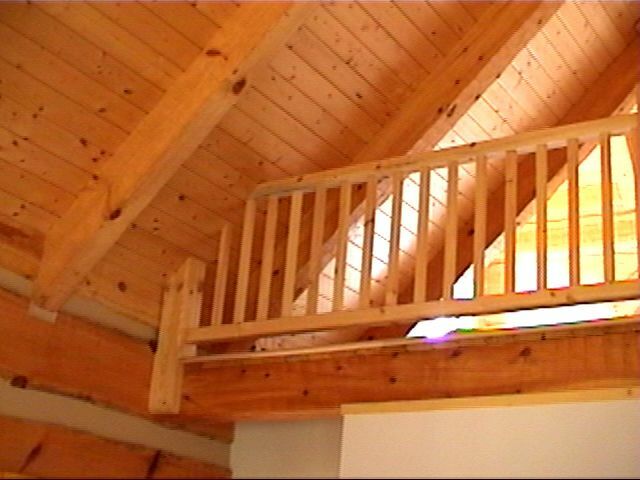 It looks like the railing has materialized inside the roof. A little weird, but I like it. 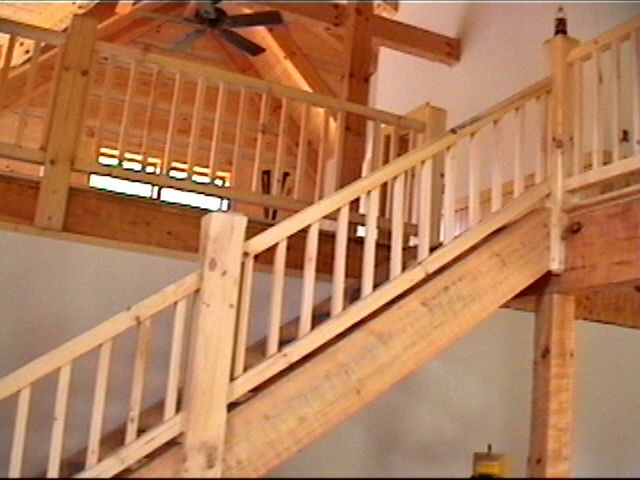 The new loft railing and stair railing. This was a LOT of work for the guys. All the interior railing took Dad and Chris about 10 days to get done. There was a lot of cutting, carving, and fitting to get the raw lumber to become this beautiful railing. 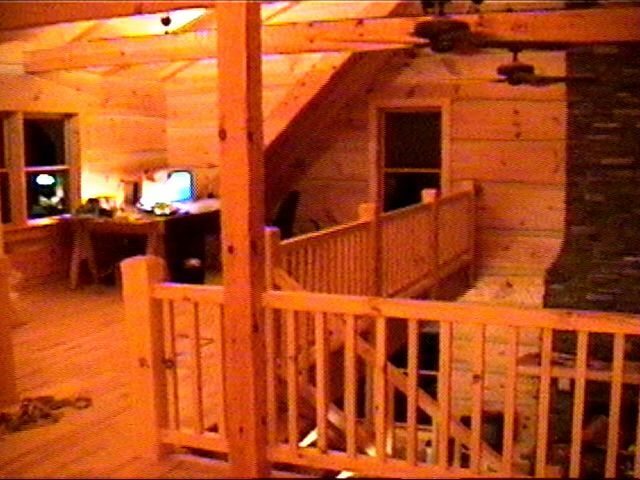 A view of my office railing from downstairs at night. My office, well... at least temporary office number 2, from the bedroom. The railing is new and after all this time without any, its fascinating to see it. 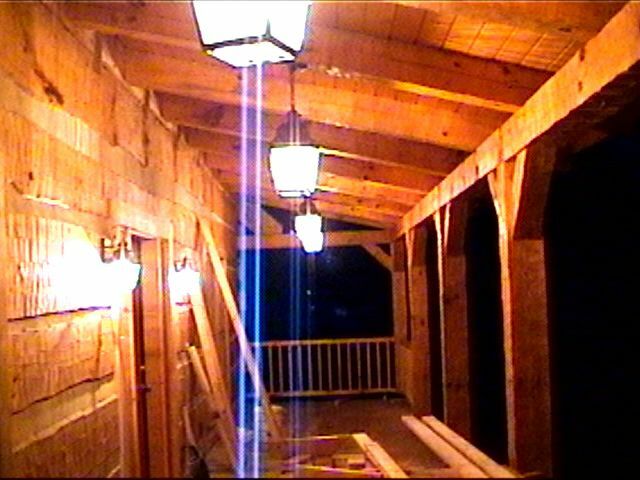 My front porch lights. 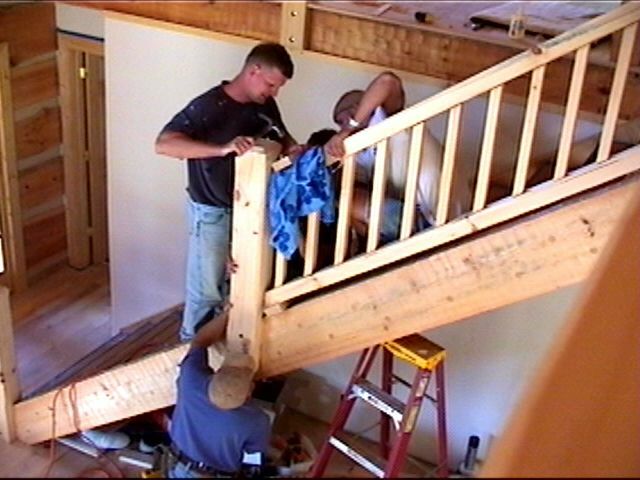 Here Chris and Dad have one section of the railing done. 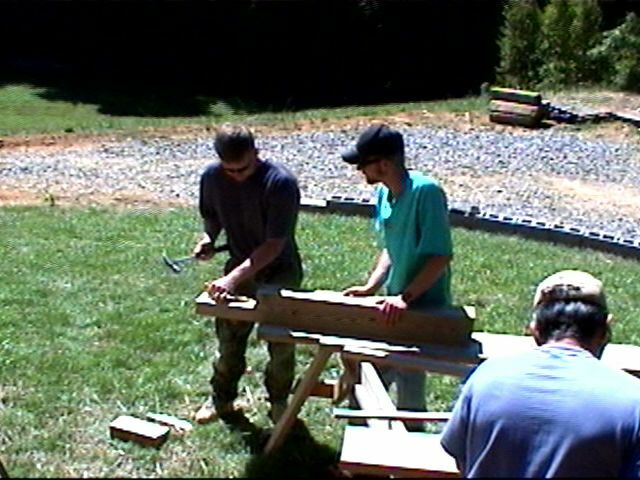 Here, Dad's working on the raw lumber for the front steps. 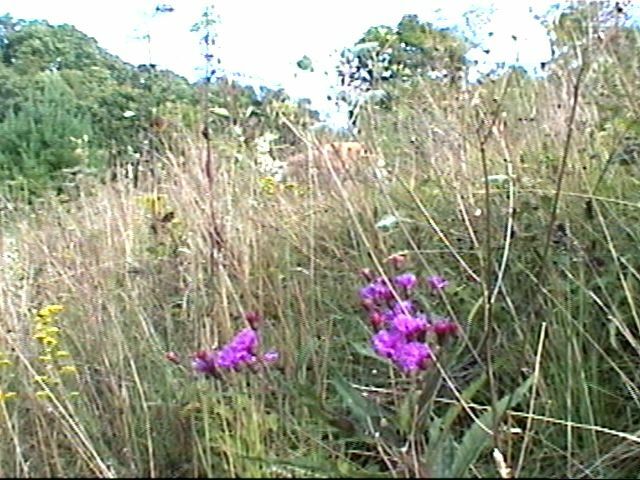 I had to get one more wild flower picture in here. I know these are the last few days of summer. Mom came up to help clean up some. She has worked a lot to help me get the house livable, or at least camp-able. 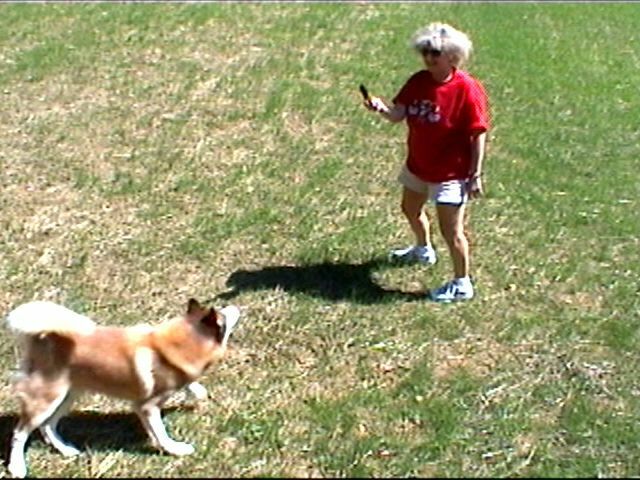 Here Mom and Timber playing in the side yard. Notice how the grass is growing in! Nick is helping Chris hold a post for the front steps. 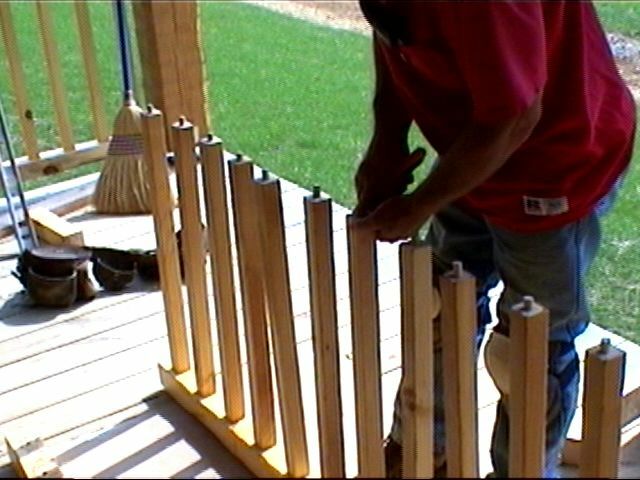 As has been the case with all the railing an posts, Chris is using a wood chisel to get that perfect fit. Here is a semi-rare plant around here. It's a Mountain Holly. 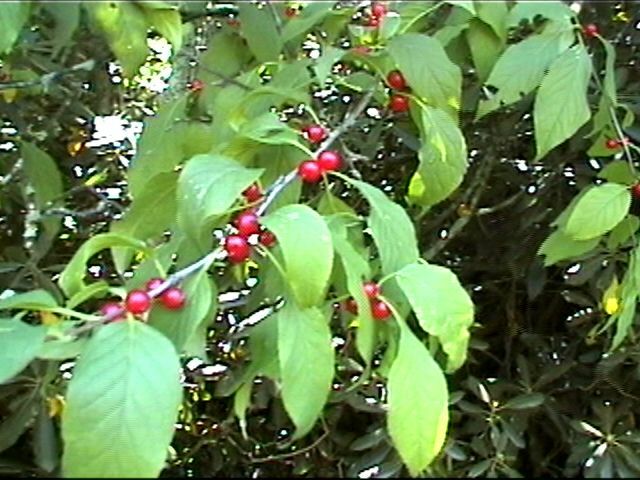 The berries on this wild shrub look like small cherries. This is the first one I've ever seen and it grows by the creek in front of the house. 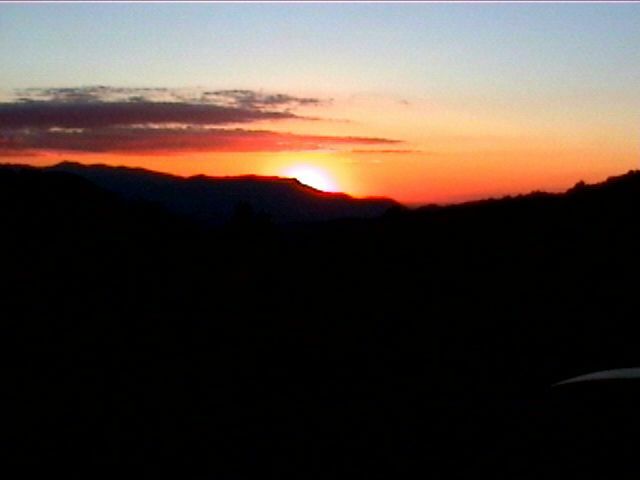 Ending this page with a sunset over the Smokies.